I've written about this plaque before. And I have to admit, there's been so much change to the Capitol building that the last time I was there, I couldn't find this plaque. It used to be downstairs from the main lobby, but when I was there the basement now connects to the new offices, built underground behind the Capitol. There was an historical display in the basement of the old building, and I couldn't find the column with this plaque on it, though I've seen it before. Speaker Straus makes an eloquent and reasoned argument for removing it posthaste. But this small plaque in the basement of the Capitol is not the most offensive piece of Civil War remembrance on the Capitol grounds. That distinction goes to the largest statue (or one of them, anyway) on the grounds, placed in front of the building on the long esplanade leading from the border of the grounds to the building. Texas lawmakers in 1895 approved a monument “to the Confederate dead” to be placed on the grounds of the Capitol. Eight years later, more than 5,000 people gathered to see the Confederate Soldiers Monument unveiled — a particularly large crowd considering Austin’s population at the turn of the last century was just 22,000. At the unveiling, John H. Reagan, the former Confederate postmaster general, told the crowd outside the Capitol that the North was to blame for the Civil War. “The people of the New England states, even as far back as 1803, when the Louisiana Purchase was consummated, opposed it, as they declared it would increase the power of the agriculture states and diminish the power of the manufacturing states,” he said, according to an account of the ceremony in the Austin Statesman. That argument, that the "East" was as guilty as the South, will come up again. 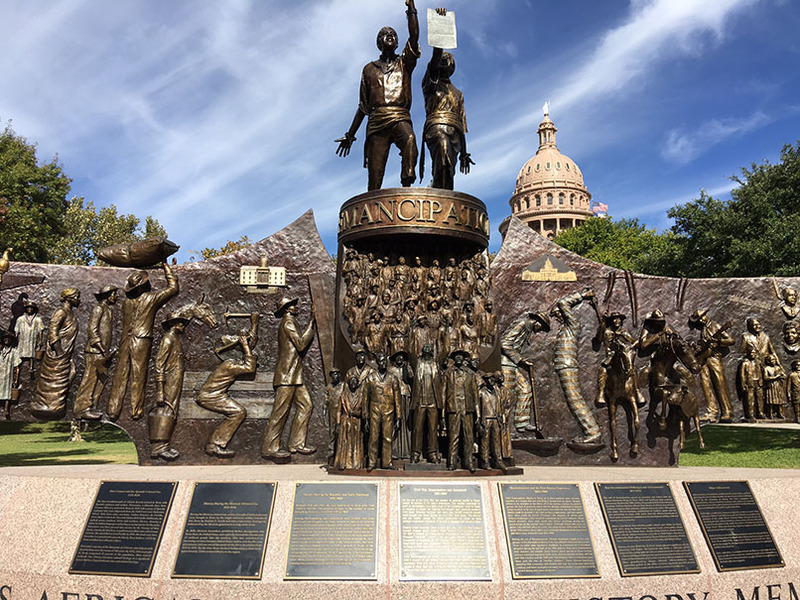 To the left of this statue, as you face the Capitol, is a large, two-sided statue that is a tribute to African-Americans in Texas. The monuments are being defended by Gov. Greg Abbott and other Republican leaders as representing a chapter of American history that shouldn’t be forgotten. 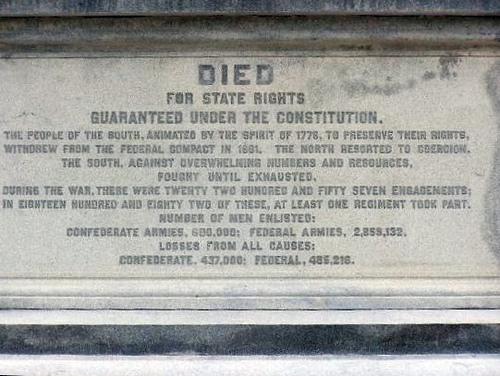 But, based on a review of the legislative record authorizing the memorials and contemporary accounts of their dedications, the monuments were erected as part of an effort to recast the war as a battle over “state rights.” Slavery and African-Americans are not mentioned on the memorials. Some history deserves to be erased, apparently, but some doesn't. What these memorials represent is what the contested plaque represents: a refusal to take responsibility for a heinous chapter in American history, to acknowledge what Wendell Berry called our "hidden wound" of racism, present from the moment Columbus touched the shores of the New World, continued by us to this day. Shortly before the unveiling of the Hood’s Texas Brigade Monument in 1910, William R. Hamby, president of the Hood’s Texas Brigade Association, said the Civil War was not a “lost cause” for the South. Hamby fought for the Confederacy and later became managing editor of Austin Daily Statesman, and then a state lawmaker. Marshall Davis, spokesman for the Texas Division of the Sons of Confederate Veterans, said the Civil War was not fought over the South’s continued interest in enslaving African-Americans. The Confederacy did not create slavery, Davis added. In other words slavery wasn't the cause of the war, petulance and spite were. Sounds about right; certainly seems to be the reason racism is rearing its ugly head again, lead by our Petulant Spiter in Chief. Take 'em all down. We're not remembering heroes or veterans with those monuments. We're trying to paper over our own complicity in evil. That is the history that should not be erased, and we should be ashamed of ourselves for even trying to.